Welcoming home your new bundle of joy often means more laundry. A lot more laundry. How does something so ridiculously cute and small create such a large mess? And with the addition of more laundry comes the age old question of which laundry detergent to use to wash those little messes. We recommend Her Little Red Wagon Laundry Soap. Perfectly formulated with plant-based surfactants and cleaning agents to get clothes, bedding and towels perfectly clean yet it is safe for baby’s sensitive skin. Shower a new mom with natural health and personal items such as Her Little Red Wagon Laundry Soap. The benefits of using all natural products on mom and baby (and even the whole family) will provide a healthy and happy start to a new life. 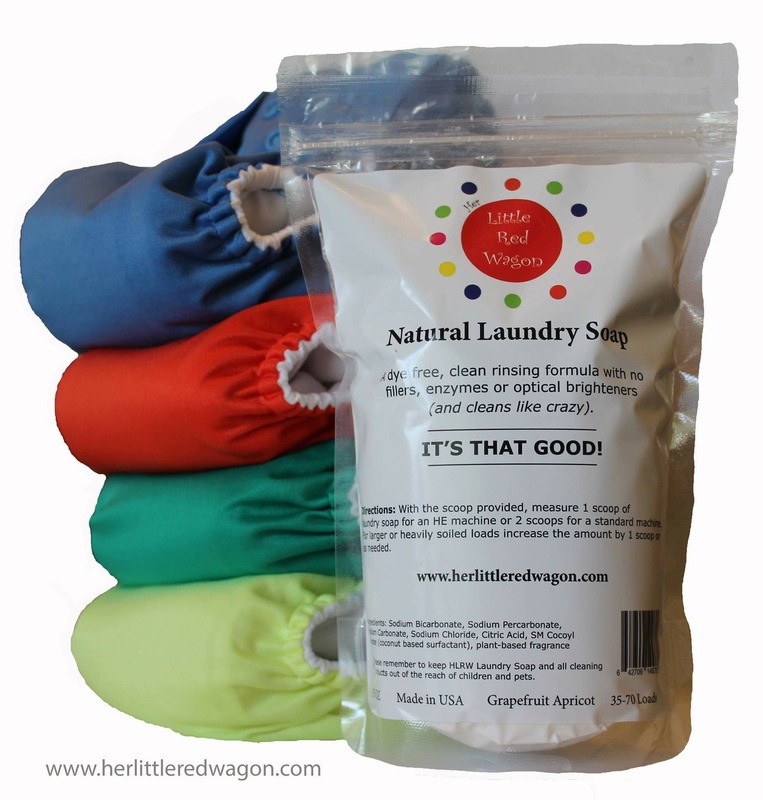 We understand laundry detergent might not get the “oohs and awws” at the baby shower but all of those cute little pants with the ruffled booties and the sweet little onesies that say “Daddy’s little man” will need to be washed and what better than an all-natural, safe laundry detergent that will keep new baby happy and healthy. 1. Choose a natural laundry detergent like Her Little Red Wagon Natural Laundry Soap free of dyes, softeners, brighteners and fragrance. 2. Opt to soften your baby's laundry naturally using wool dryer balls instead of synthetic fabric softeners or dryer sheets. 3. Pre-treat stains. This one his hard. It takes time, some remembering... and in those first few months it may seem impossible. But trust us, just pretreating with a little stain remover before throwing baby's clothes in the hamper can make all the difference in the world. 5. Harness the power of the sunshine to make stains disappear! Organic stains such as food or poo can be bleached out simply by placing the clean, wet clothing in direct sunlight. After a few hours you'll notice the stain has lightened or it's completely gone. 6. Get to know your wash machine. Actually read your manual (as exciting as it is). You may find that there are better settings for what you are washing - let your machine get your clothes clean instead of relying on more chemicals to get the job done. HLRW Laundry Tip: Create an economic stain remover by placing 1 oz. of HLRW Laundry Soap in a clean spray bottle filled with water. Let dissolve, shake and spray on clothes that need pretreated. Launder as usual. IT'S THAT GOOD! Her Little Red Wagon Laundry Soap was established in 2012 shortly after the birth of our daughter who came into this world with some of the most sensitive skin I’ve ever witnessed. Many commercial brands that touted that they were safe for sensitive skin fell short, leaving my daughter with rashes and skin irritation that would linger for days. After copious amounts of research, trial and error, and product testing, I developed Her Little Red Wagon Laundry Soap. We’ve solely used this detergent in our house ever since (including on cloth diapers) and I couldn’t be happier as a mother and entrepreneur that this product works so well for my family and for many others. It is our mission and hope that anyone seeking an environmentally friendly, skin-safe laundry detergent will find solace in using our product and that we can continue the movement away from harsh chemicals that harm our bodies and the environment. 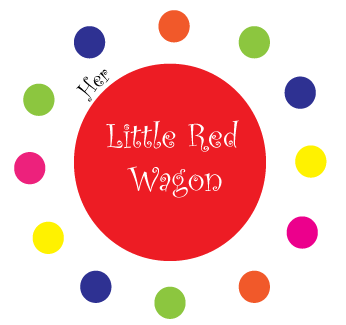 Be sure to visit Her Little Red Wagon's Facebook Page. “As a new mom, reducing the number of chemicals my baby is exposed to has been a high priority for me. 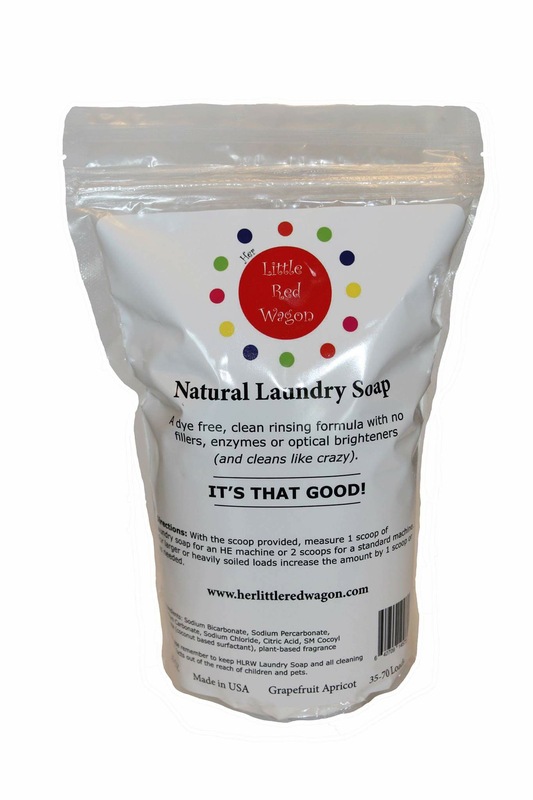 I found Her Little Red Wagon laundry soap to be a great solution for our laundry needs. We have reduced chemical exposure, reduced product packaging waste, and the scents are pleasant and not overpowering and rinse clean after use. Love it!” – Jenn M.